For every book sold, 1 Euro goes to animal protection. Iwon Blum studied scientific illustrations at the Zurich School of Arts and graduated in 2001 with this book as her dissertation. 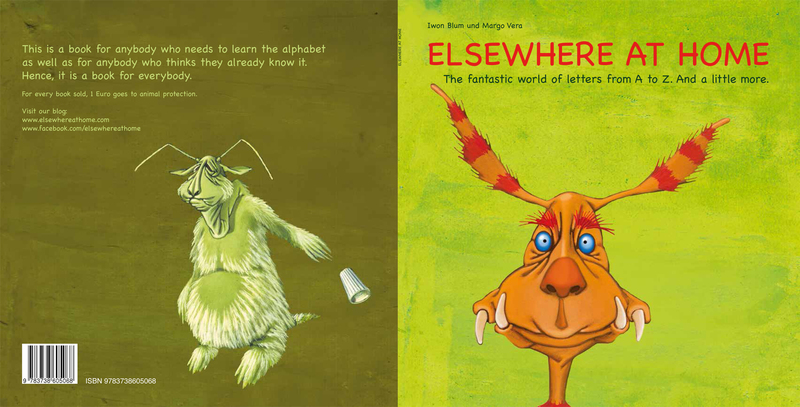 The idea for this book came from the unpleasant experience in her primary class, being confused by these hostile letters, and thus refusing to learn how to read and write. Only later when the little Iwon had accepted all 26 letters as her friends, did reading and writing become fun. So much fun to the point that big Iwon works as a journalist and gets to play with the alphabet all the time. Margo Vera has found her love for poetry in early stages of her life. The rhymes, the grooves, all the different kinds of stories packed into a little melody of words. As she came across Iwon‘s 26 little big friends, she could not resist to give them a world in English. Now those little creatures are Margo‘s friends too. Thank you, Iwon.